OSWEGO – A SUNY Oswego geology student will give his research team’s presentation April 17 at Quest on the Fallbrook Recreation Center dam removal project and its effect on groundwater and fish. levels in the aquifer at the college’s Fallbrook Recreation Center after the U.S. Fish and Wildlife Service removed a dam. 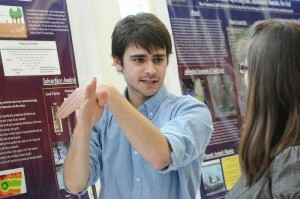 Here, Valentino talks at the 2012 Quest symposium about another aquifer study at Rice Creek. American eel along Rice Creek. Quest, an annual daylong symposium at SUNY Oswego dedicated to sharing the scholarly and creative pursuits of faculty, staff and students, is free and open to the public. Removal of the 65-by-13-foot dam allows water and fish to flow unimpeded along the Rice Creek tributary of Lake Ontario. Valentino, a junior majoring in geology and mathematics, said the presentation will cover research he and five other students did at the site, mapping out the aquifer and groundwater systems before and after the dam project. An aquifer is an underground layer of water-bearing rock from which groundwater can be extracted using a well. The presentation covers findings made during a collaborative class project with Seth Pratt, Derek Mulligan, Liz Okst, C.J. Spath, John Lohan and Valentino, with the guidance of Valentino’s father, geology professor David Valentino. “We split the area up and had each group run surveys, then we all came together with the data we collected to look at the bigger picture of the dam area,” Valentino added. The team’s scholarly poster for Quest documents the research techniques, information about the Fallbrook site and how the dam removal affected the aquifer system. “What we found was that after they took out the dam there was a decrease in the aquifer system water level on the east side; it actually lowered quite substantially,” Valentino said. According to the U.S. Geological Survey, groundwater in aquifers supplies about half the nation’s drinking water, and is a main source of water when fresh surface water is unavailable. Removal of dams and other manmade alterations returns the water level in aquifers to their original levels. Valentino is not a newcomer to group research, as he participated in SUNY Oswego’s Global Laboratory in Brazil at the Federal University of Alagoas in Maceio in summer 2012. David Valentino is geology department chair at SUNY Oswego, while Ben Valentino’s mother, Karen Valentino, is a geologist who has taught as an adjunct at SUNY Oswego for many years. Parking is free April 17 for visitors to Quest, when hundreds of talks, panel discussions, demonstrations and concurrent events will take place largely in the Campus Center and nearby Lanigan and Snygg halls.